Condition Lab, an architectural research team led by Professor Peter W. Ferretto at the Chinese University of Hong Kong’s (CUHK) School of Architecture and the School of Architecture and Urban Planning at Guangzhou University (GU) recently opened the Gaobu Book House, a collaborative project two years in the making. 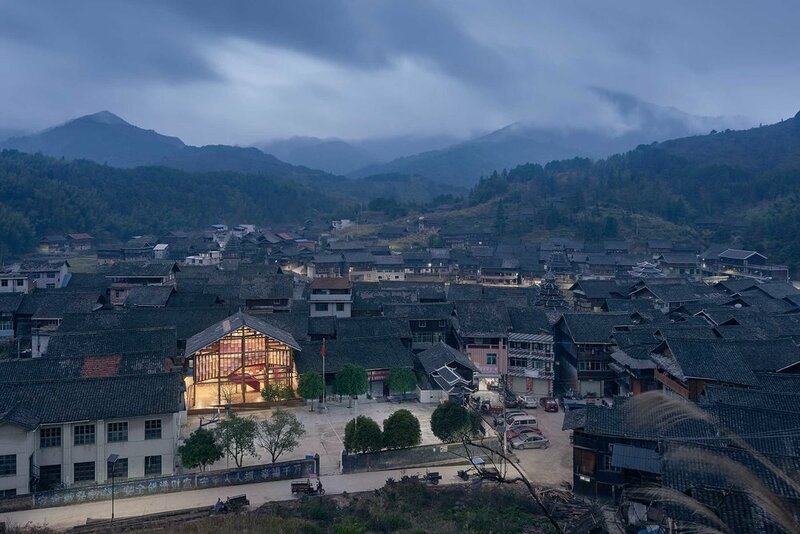 Over this period, the universities’ research and design teams visited and lived with the only 2,500 villagers of Gaobu, a Dong ethnic minority village in Hunan Province, to better understand the community and its unique cultural heritage that they hoped to help preserve and restore. The team soon realised that educational facilities such as schools and libraries are scarce in the village, and children are usually sent to study elsewhere in nearby towns. Aiming to promote learning through play, the team conceived an education incubator as a response. The team took their design cues from traditional Dong vernacular, where a timber frame is adapted and reconfigured to suit the structure’s purpose. Having observed how stairs are a key architectural element in the Dong’s daily life, as a place for coming together and for children to play, stairs became a central element of the library, where the team hope that the children of Gaobu will develop a love for reading through play and fun. Inspired by the Book House we’ve compiled our own ‘storybook’, annotated by a poem that Professor Peter W. Ferretto, Associate Professor at CUHK’s School of Architecture, was moved to write after the project’s completion. Once upon a time, in a small village tucked away in the mountains, was a special house. From far away it looked like all other houses in the village, a steep pitched roof and all made in wood. But as you walked closer, one noticed a difference. It started with a red glow, a bright colour radiating from inside. The house had no door, actually no door of any kind, front, back nor hidden door. The house was totally open. To enter one had to climb a bright red stair that poked out like a rude tongue from the mouth of the house. However, this was not a house for everyone, this was a house for children. The inside of the house was warm. Every wall was made from books, endless coloured shelves stacked with books about many different subjects, real and imaginary. The house was itself a story about how children see the world, a dream packed with wonder and adventure. Children didn’t sit on chairs, oh no, in the Book House children sit on stairs and inside the walls. Every day at different times, magical windows would illuminate with rays of colour, forming a kaleidoscopic jigsaw. The house started to move, shelves became tables, walls expanded into play rooms. Finally, just when you made yourself comfy, when you sat down and started to read a delicious book, the biggest transformation of all happened, straight in front of your eyes. The wall that until then was made of wood, magically became a huge crystal surface. Hundreds of diamonds formed a, chandelier like, hanging wall that illuminated the whole space. We all dream of places to escape, we all need stories to understand the world we live in. The Book House is a small escape house for children to ponder about the wonders of life, just in case we adults might forget them.